“At A Time Like This In Scuppernong Valley” from Christian Faith Publishing author Gloria M. Prather shares the success story of a girl who escaped oppression then survived the dangers of street life as she forged a life of success. “At A Time Like This In Scuppernong Valley” offers inspiration and encouragement to young people everywhere. “At A Time Like This In Scuppernong Valley”: an inspirational story for children, teens, and young adults, especially those experiencing troubling circumstances. “At A Time Like This In Scuppernong Valley” is the creation of published author, Gloria M. Prather. Gloria was born on a farm in Kenbridge, Virginia. She lived there until she graduated from Lunenburg High School. She moved to New York and started working as a maid. She later moved to Massachusetts where she worked in a sweater mill and a candy factory. The money she earned was used for her tuition at Morgan State University, which is located in Baltimore, Maryland. She earned her BS degree in Home Economics Education. She later earned a BS and MA equivalency from Bowie State University of Bowie, Maryland. She taught for thirty-three years in Prince George’s County schools in Upper Marlboro Maryland. She and husband, Alfred, are retired. They now live on a farm in Kenbridge, Virginia. 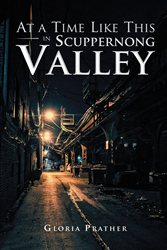 Published by Christian Faith Publishing, Gloria M. Prather’s new book, “At A Time Like This In Scuppernong Valley” provides an account of a destitute teenager born in a meager place where only the strong survive. She made one bad decision that happened to offend the villainous overseer. To escape his retaliation, she ran away and became a shadow-street child in a big city. This is an incredible story about struggle, survival, and the darker side of life many teenagers will never know. The ups and downs experienced while wandering an unfamiliar city taught her many life lessons as she tried to find a safe place in tunnels, abandoned buildings, and alleyways. She was sustained by the belief that her God-fearing grandmother’s teaching would see her through. She aligned herself with determination and became a great success story, a force of stability and healing for other teenagers. View a synopsis of “At A Time Like This In Scuppernong Valley” on YouTube. Consumers can purchase “At A Time Like This In Scuppernong Valley” at traditional brick & mortar bookstores, or online at Amazon.com, Apple iTunes store, or Barnes and Noble. For additional information or inquiries about “At A Time Like This In Scuppernong Valley,” contact the Christian Faith Publishing media department at 866-554-0919.